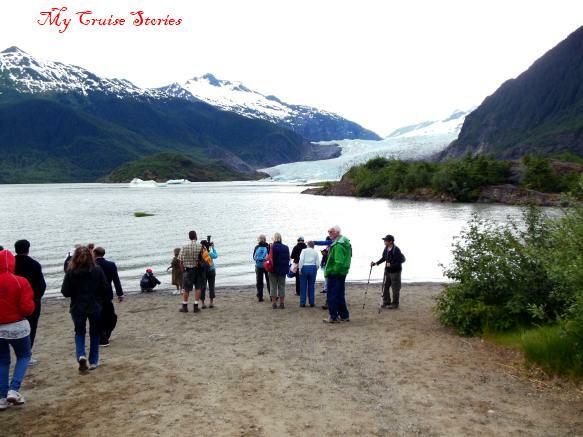 After visiting Glacier Gardens on a shore excursion from the Holland America Westerdam, our tour group piled back onto the busses and headed out to Mendenhall Glacier. I really wanted to see Mendenhall since I had not made it out to the glacier on either of my previous visits to Juneau on the Sun or the Safari Quest. Quite a few of the relatives I went to Alaska with came on this excursion. We had thought about just taking the glacier express bus straight to the glacier on our own without booking anything through the ship. Going both there and to Glacier Gardens on the same visit would have involved taking a taxi between the two and a city bus from the garden to town, so we opted for a shore excursion from the ship that did both. A good choice since we didn’t see any taxis. As the bus pulled up to the visitor’s center Russ-who-drives-the-bus said he would pick us up in an hour. After an hour and five minutes he would leave. Normally tours insure all passengers get back on the bus, but since the visitor’s center there does have other transportation and people can hike off on their own they can’t wait forever. We would have liked to have a little more time there. My sister Linda and I wanted to hike out to the waterfall, but our other relatives preferred staying at the visitor’s center. 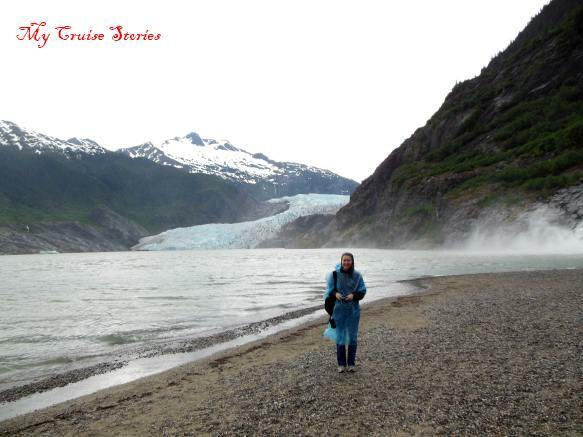 I was a bit disappointed that we would not actually get to hike on the glacier itself as I had done at Baird Glacier, but getting on Mendenhall involved either a helicopter or an all-day guided expedition hiking through rough terrain, neither of which came at a price we wanted to pay. My Aunt Grace and I would have loved to go dogsledding on the glacier, but since that involved a helicopter it really wasn’t in our budget. One of the guides at Glacier Gardens had said rain was due at 9pm that night, but apparently the rain did not pay attention to the weather report. On the bus ride from the garden to the glacier the weather began to turn. By the time we got off the bus the wind had kicked up and rain began to fall. 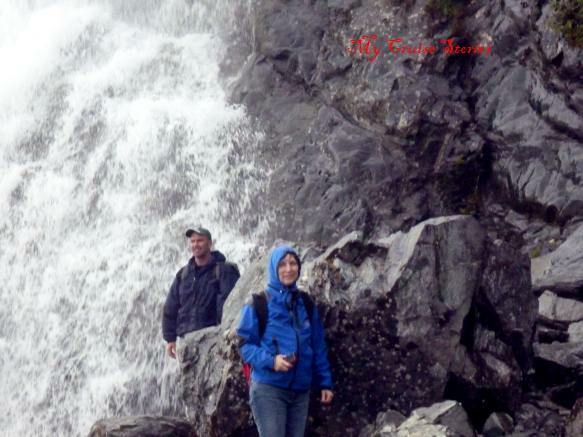 We asked the driver if the waterfall hike would be worth it in that weather and he said yes so we dug our jackets out of our backpacks and headed out while the rest of the family went for the shelter of the visitor’s center. 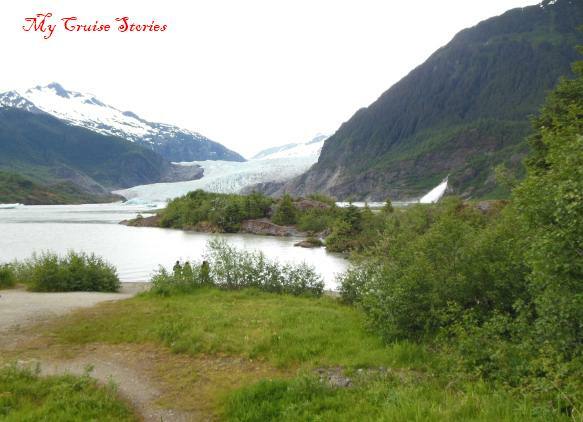 Outside the visitor’s center a viewpoint offered a panoramic view of the glacier across Mendenhall Lake. 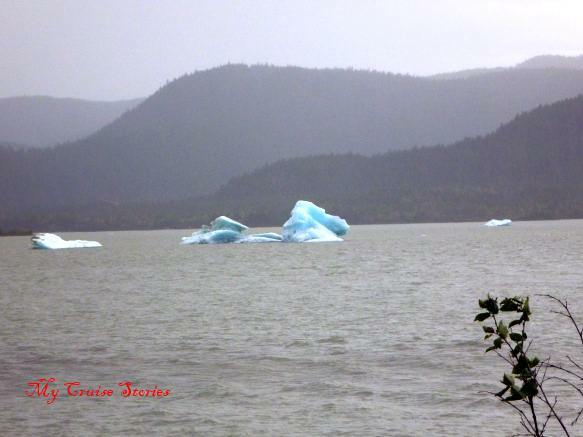 Little icebergs floated about the lake, the largest ones near the glacier where they hadn’t had as much time to melt. As we set out for the path to the waterfall trail, an employee of the visitor’s center ushered us up against a nearby wall where we had to wait for a slow-moving ambulance coming up the trail to pass. Following the ambulance came a horde of people making their way back to the visitor’s center. It may look like a garbage bag, but the cheap rain poncho actually works. While speedwalking our way down the trail to make up lost time, Linda decided to stop a minute and put on the rain poncho she had purchased on the ship the previous day. I just put up the hood on my jacket. By the time we got to the glacier the rain had slowed to more of a sprinkle and the wind had lessened as well, though the sky remained gray and threatening. 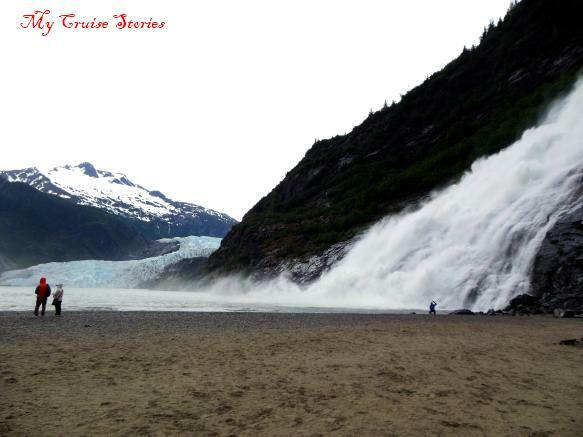 We took photos of the glacier and the waterfall, some of both in the misty waterfall spray. 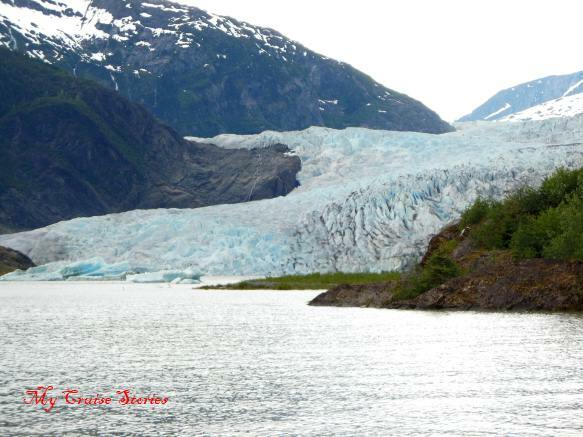 The glacier seemed so close, yet is inaccessible from the visitor’s center. 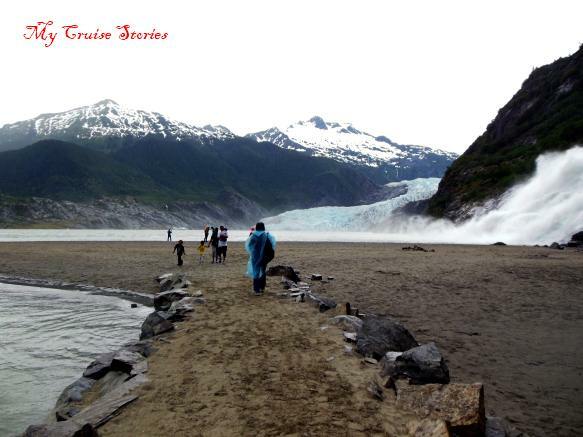 I did see glacier hike excursions online that would take people there on foot. Not only did they cost quite a lot, but less than 2 hours of an over 7 hour hike actually involved hiking on (or climbing) the glacier itself. The rest consisted of things like scrabbling through the scree to get there and back. It also took too long for the time we had in port so we had no choice but to pass. After a brief spell as near to the glacier as we could get, we set off back down the trail to the visitor’s center at a rapid pace due to our limited time there. Somewhere along the way the sun returned to the now-dry sky. Linda got too hot under the unnecessary at this point rain poncho and put it back in her bag. We reached the visitor’s center with just enough time to wander in and take a brief look around, but not enough time to really see anything. The bus did not appear as quickly as the driver had said though, so we could have seen a bit more. Near the visitor’s center a viewpoint on the lake offered almost better views than we got from up close at the end of the trail. More distant, but also more of it. 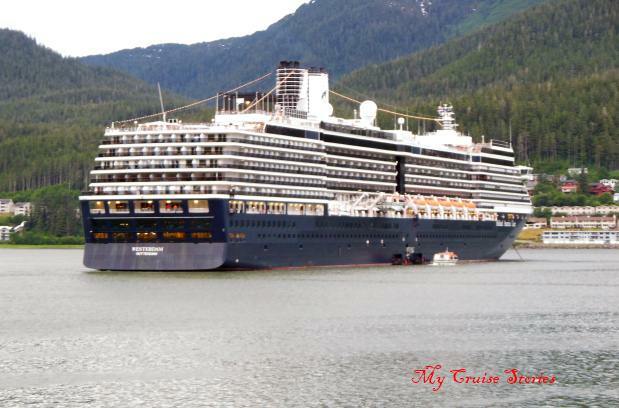 This entry was posted in Alaska, Holland America, Port Cities, Ports of Call, Shore Excursions, Westerdam and tagged Juneau. Bookmark the permalink. The visitor’s center and view of the glacier from there are definitely worth seeing. 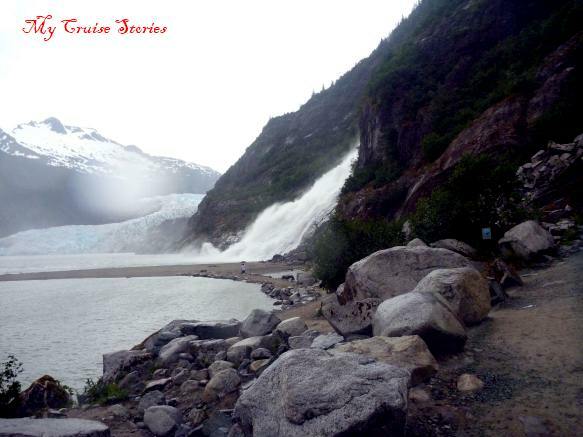 The pictures from your hike are quite interesting and you did get a good picture of the glacier. I agree with Ruth. 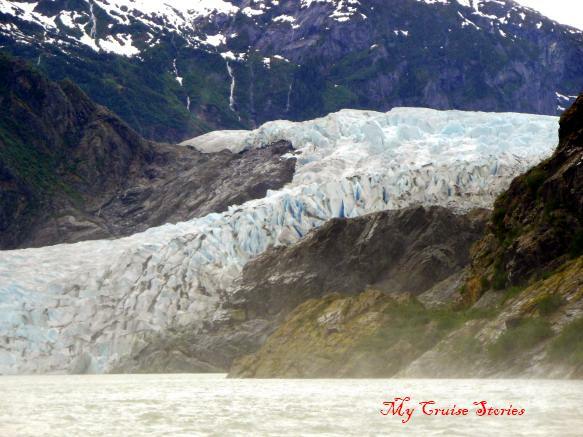 I love the up close and personal pictures you took of the glacier. It seems like you were very productive in your hour of exploring. That is one bus I would definitely not want to miss. I’d be so paranoid I might have just stayed on it with Russ. Staying on the bus would defeat the purpose of going to see the glacier in the first place…and there’s always the glacier express bus to get back to town. You got a lot closer to the glacier then we did on the river trip. Same lake where the rafts launched, but the other end. Wow, we were just there! We were afraid we wouldn’t make it back to the bus in time so we didn’t hike to the waterfall. Glad to hear we didn’t miss a better view of the glacier from there. We brought some cash so we could catch the glacier express bus in case we missed the tour bus. We had tickets for the Mt. Roberts Tram as well though so we wanted to get back with time left for that.